This is part 4 of my blog series, SOS: Starting Out Speaking for Beginner Speakers. You can read Part 3 by clicking here. I’m here because I have a very important message: I think we have found the most important factor for success. And it was found close to here, Stanford. Psychology professor took kids that were four years old and put them in a room all by themselves. And he would tell the child, a four-year-old kid, “Johnny, I am going to leave you here with a marshmallow for 15 minutes. If, after I come back, this marshmallow is here, you will get another one. So you will have two.” To tell a four-year-old kid to wait 15 minutes for something that they like, is equivalent to telling us, “We’ll bring you coffee in two hours.” (Laughter) Exact equivalent. So what happened when the professor left the room? As soon as the door closed… two out of three ate the marshmallow. Five seconds, 10 seconds, 40 seconds, 50 seconds, two minutes, four minutes, eight minutes. Some lasted 14-and-a-half minutes. (Laughter) Couldn’t do it. Could not wait. 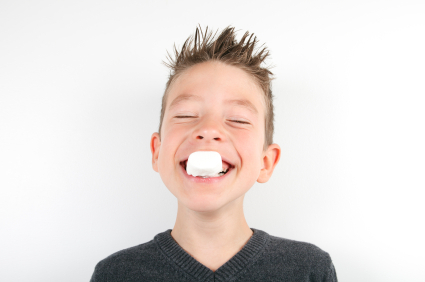 What’s interesting is that one out of three would look at the marshmallow and go like this … Would look at it. Put it back. They would walk around. They would play with their skirts and pants. That child already, at four, understood the most important principle for success, which is the ability to delay gratification. Self-discipline: the most important factor for success. 15 years later, 14 or 15 years later, follow-up study. What did they find? They went to look for these kids who were now 18 and 19. And they found that 100 percent of the children that had not eaten the marshmallow were successful. They had good grades. They were doing wonderful. They were happy. They had their plans. They had good relationships with the teachers, students. They were doing fine. Why is this such a great intro? Joachim is using the power of story – and even better, a funny story. If you are like me, you’re not a natural-born comedian so you might hesitate to use a joke or a funny story when you first step up to the mic. (I have a great, off-the-wall sense of humor, though, and a dry wit.) The story doesn’t have to be funny. But stories, if told well, are a natural way to connect with your audience. Jesus often used stories to teach His disciples. For example, when I spoke in Canada at Doreen Penner’s women’s retreat, I began my presentation with the fairy tale story of Cinderella. This related to my speaking topic on fulfilling your God-given purpose, Walk In The Shoes That Fit You. What’s your favorite story? What stories can you share in your intro or even sprinkle throughout your presentation? Remember and write down your stories to tell when you speak somewhere. You can also begin to collect stories from family, friends, peers, books, and the news to share with your audience. Stories connect hearts and are a powerful truth-teaching tool. In the next post, we’ll talk about your bio that the event planner will use to introduce you right before you go to the presentation area. Come hear our anointed keynote speaker Doreen Penner and our other amazing speakers at the RELEASED! Women’s Conference on April 27, 2013, in Belton, MO. Click here to learn more. We’d love to see you there!